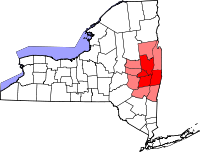 Location in Schenectady County and the state of New York. The Dellemont-Wemple Farm was added to the National Register of Historic Placesin 1973, and the Enlarged Double Lock No. 23, Old Erie Canal in 2008. The Mabee House, at the Mabee Farm Historic Site, the oldest surviving house in the Mohawk Valley, was added to the National Register of Historic Places May 22, 1978. It is a property of the Schenectady County Historical Society, being donated by a last descendant in his particular line, Mr. George Eugene Franchere, on January 29, 1993, the 287th anniversary of the original deed. It is currently being operated as a living history museum, conducts school programs, and events for the public. Rotterdam has historically been a good town for baseball. For many years they brought up teams that would do well in the little league tournaments and Babe Ruth tournaments. They would even have one team go on to win a national championship in the latter. In August 1977, the all star team Carman little league (one of the little league organizations within the town, now referred to as RC little league) would go on to qualify for the little league World Series in Williamsport, Pennsylvania. They would go on to finish 4th. 3 years later in 1980, the same boys from that Carman team, along with a few mixed in from Rotterdam little league (the other little league organization in the town at the time) would become Babe Ruth World Series champions. They clawed their way out of the losers bracket to defeat Hawaii in 2 games in one day for the title. The tournament took place in Williston, North Dakota. The Mohawk River defines the northeast town line. The New York State Thruway passes through the town. According to the United States Census Bureau, the town has a total area of 36.4 square miles (94.4 km2), of which 35.7 square miles (92.4 km2) is land and 0.77 square miles (2.0 km2), or 2.11%, is water. The Rotterdam Town Board consists of five members, including the Supervisor who is a voting member. As of the census of 2000, there were 28,316 people, 11,544 households, and 8,092 families residing in the town. The population density was 787.0 people per square mile (303.9/km²). There were 11,990 housing units at an average density of 333.3 per square mile (128.7/km²). The racial makeup of the town was 97.26% White, 0.95% Black or African American, 0.16% Native American, 0.57% Asian, 0.01% Pacific Islander, 0.21% from other races, and 0.83% from two or more races. Hispanic or Latino of any race were 0.97% of the population. There were 11,544 households out of which 29.4% had children under the age of 18 living with them, 55.7% were married couples living together, 10.6% had a female householder with no husband present, and 29.9% were non-families. 25.8% of all households were made up of individuals and 12.6% had someone living alone who was 65 years of age or older. The average household size was 2.44 and the average family size was 2.94. In the town, the population was spread out with 23.1% under the age of 18, 5.8% from 18 to 24, 27.9% from 25 to 44, 24.1% from 45 to 64, and 19.1% who were 65 years of age or older. The median age was 41 years. For every 100 females, there were 92.9 males. For every 100 females age 18 and over, there were 88.5 males. The median income for a household in the town was $46,267, and the median income for a family was $54,542. Males had a median income of $37,536 versus $27,527 for females. The per capita income for the town was $21,457. About 2.8% of families and 4.5% of the population were below the poverty line, including 5.2% of those under age 18 and 5.9% of those age 65 or over. Antonia Hills- A small development off of Route 7; built by the Valentine Family. Colonial Manor – A well-sized community between Cold Brook and South Schenectady, with housing developed in the 1950s by Charles Juracka. Carman – A relatively small community anchored by Carman Park. Cold Brook – A well-sized suburban community placed on the former Campbell Family estate. Galluci Gardens; A cul-de-sac with a handful of single-family detached homes, and 3-4 Tudor homes and a few colonial homes. Lower Rotterdam Junction – A hamlet south of Rotterdam Junction on Route 5S. Pattersonville – A hamlet in the northern part of the town on the town line. Rotterdam – A large suburban community west of Schenectady. Rotterdam Junction – A hamlet near the Mohawk River on Route 5S. Serafini Gardens – A medium-sized development on the border of Guilderland and Rotterdam. Contains 50-75 homes. Skyline; Development sitting on a big hill overlooking rotterdam, with about 15-20 homes. Although the town was settled by the Dutch, Rotterdam is heavily populated by people with Italian heritage. Nearly 80% of all households have someone who is at least 25% Italian; because of this, Italian restaurants are very common in Rotterdam. ^ "Profile of General Population and Housing Characteristics: 2010 Demographic Profile Data (DP-1): Rotterdam town, Schenectady County, New York". U.S. Census Bureau, American Factfinder. Retrieved 2012-07-05. ^ University of the State of New York Bulletin. University of the State of New York. 1914. p. 58. ^ "Geographic Identifiers: 2010 Demographic Profile Data (G001): Rotterdam town, Schenectady County, New York". U.S. Census Bureau, American Factfinder. Retrieved 2012-07-05. ^ a b c d "American FactFinder". United States Census Bureau. Retrieved 2008-01-31.